If your kitchen cupboards are like mine, sometimes you’re afraid to open up a cabinet door for fear of what might come falling out. And as much as I try to keep my kitchen clutter to a minimum, it’s hard to organize little spice bottles on a shelf (that are sometimes too high to reach) or in a drawer. When I got the opportunity to review YouCopia’s Classic SpiceStack® product, I was genuinely excited because – with so many spices as a baker – I have trouble keeping track of what I have and where it is. First let me share the story of how I discovered YouCopia. I was attending the International Home + Housewares Show at McCormick Place, where global companies showcase what’s new in the industry for the home. Companies from over 2 dozen countries, and I got the chance to meet Lauren Greenwood, one of YouCopia’s founders. 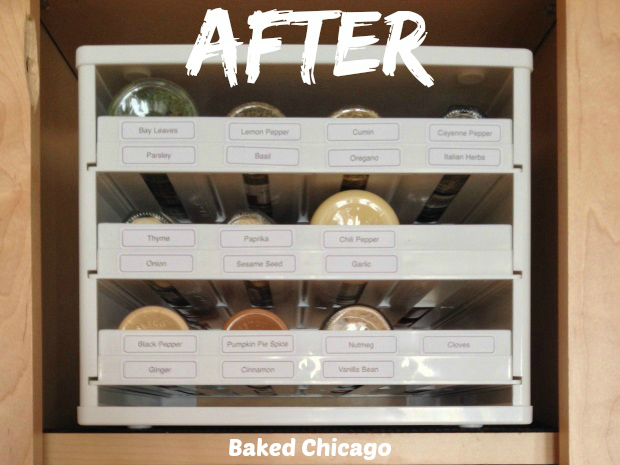 After seeing the range of cool storage solutions they have, I learned they were a Chicago company. Go Chicago! And they are exactly 1.7 miles from my house. Small world, huh! Here’s a shot of the cupboard next to my stove and kitchen sink. It’s the portion of my kitchen counter where I tend to do the most mixing, prepping. I have two very narrow shelves (my house was built in 1892 so everything is narrow and small by today’s standards) where I keep the majority of my spices. I use two Lazy Susans so I don’t have to grab blind – because I’m too short to see what’s in the back. As you can see, it’s not awful but it’s hardly easy to find things. I’m constantly having to readjust labels so I can read them from their position on the turntable. And I’ve got too many spices for the turntable, so some jars get put to the side and other small jars get stacked on one another. So I emptied the shelf with the most spice jars to make room for YouCopia’s Classic SpiceStack®, which holds 24 full-size or 48 half-size spice bottles (round or square). Wouldn’t you know I found I had duplicate bottles of ground cinnamon because I thought I’d run out. One of the bottles fell off the turntable and landed at the back of the shelf; I wouldn’t have known it was there except when I removed all the spice jars. Currently the Classic SpiceStack® comes in either white or silver/black. Two things I liked immediately out of the box: NO ASSEMBLY REQUIRED (yeah!) and units are stackable. The package comes with 96 removable drawer labels (48 printed and 48 blank), so I quickly matched the labels to the spices I had. In less than 4 minutes, I had a compact, neatly organized spice caddy that stored more spice jars in one shelf than I could previously store on a turntable. 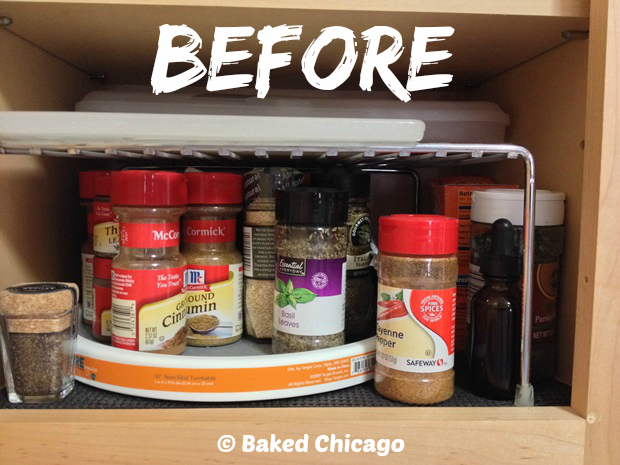 As I mentioned before, being short makes it hard to reach upper shelves so I used to be forced to pile on all the often-used spices inside the lowest shelf – just to reach ingredients I cook with frequently. But the YouCopia Classic SpiceStack® has the ability to slide out a tray of spices and lower it to an easily reachable height. 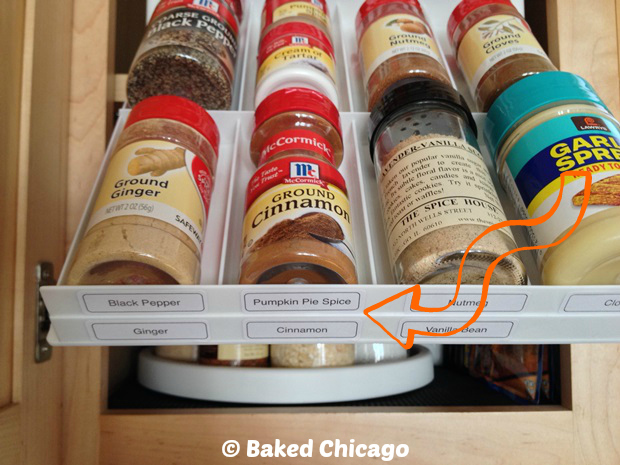 With the labels on each compartment of each shelf within the YouCopia Classic SpiceStack®, I can quickly find what spice I need without having to “spin the wheel” or guess where it is. By assigning a space to a specific spice, I was able to group like spices together to make it easy to get multiple spices together for any recipe. 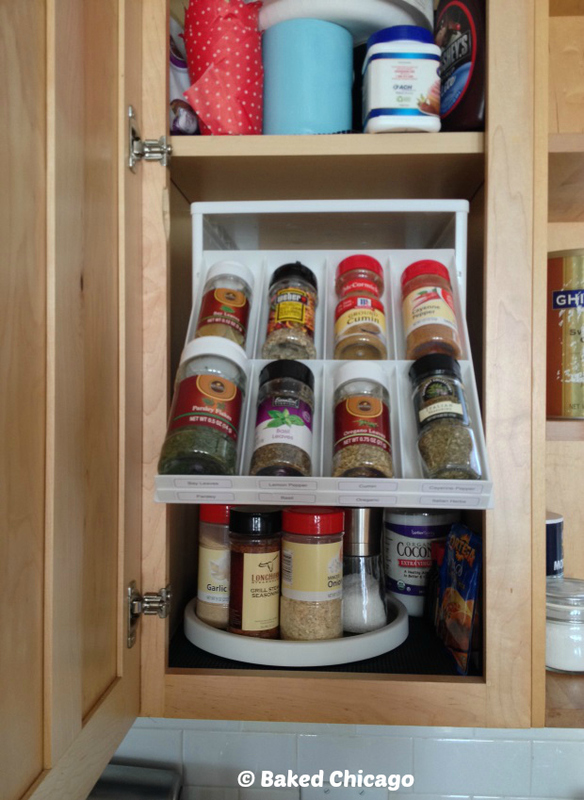 If you’ve got tons of spices like me (I’ve got to buy another Classic SpiceStack® for the shelf below), they do make larger models, including the Chef’s Edition SpiceStack® which holds 30 full-size or 60 half-size spice bottles. I think this product, as simple as it is, is quite genius. It’s really functional and easy to implement, use. My only recommendation to YouCopia would be to consider extending the number of colors the SpiceStack® comes in. White and silver/black are great for most kitchens, but I always enjoy a pop of color so I wouldn’t mind this in a tangerine or Caribbean blue. In addition to the SpiceStack®, YouCopia has stack products for coffee, tea and baking accessories. You can find YouCopia at traditional bricks-and-mortar stores, like Target, The Container Store and Bed, Bath & Beyond. It’s also available online at Amazon.com. Click here for a complete list of where to buy YouCopia products. Coming this fall are some exciting, new products, including YouCopia’s version of a Lazy Susan that looks like a real winner. You should also check out their website, where they have a fun blog with organization tips from an industry expert, a free e-book “30 Days of Organizing,” and a forum where product fans called YouCopians share their organizational stories. Now that my spices are neatly organized, I think I need to work on the loose lids and pans that I pile into the cupboard next to the stove. What part of your kitchen needs to the most help to control the chaos? Disclosure: I was given a free sample of YouCopia’s Classic SpiceStack® to review. I get no additional benefits for talking about this product or company. All opinions about this product are 100% my own.